It is with much excitement that we launch our #LNbeachclean Photography Challenge and invite all in the Loreto Normanhurst community to participate over the summer break. As you may be aware, ocean plastic is an enormous problem with estimates of over 5 trillion pieces in the water. The immediate consequences to marine wildlife and sea-birds are dire and it is likely that the human population will be affected as toxins that accumulate in tiny fragments of plastics enter our food chain. Below you will find a few more details about the project and the above collage of internet-sourced images may provide inspiration. NOTE: Students have been sent an email in which rules and guidelines as their online and physical safety is paramount; if applicable, please review these with your daughter. Our community’s contribution to the global movement to try and reduce ocean plastic by removing it from the beach. Collect plastic off the beach (or the bush, or wherever you see it!) and then take a photo. Dispose of the plastic in the appropriate bin – separate it into recyclable or landfill. Send your image via Direct Message to the Loreto Normanhurst Instagram account @loretonh with the hashtag #LNbeachclean or email it to us. 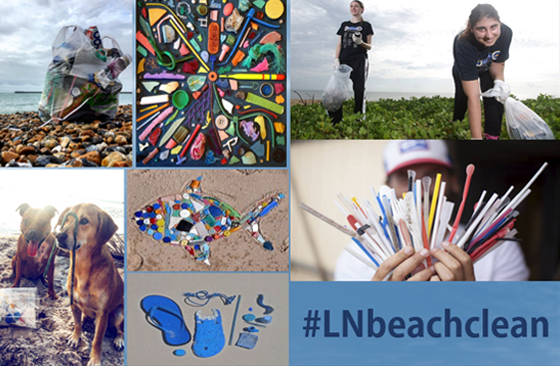 NOTE: you can post to your private social media too in order to raise awareness and show off your artistic abilities, but don’t forget the hashtag #LNbeachclean!